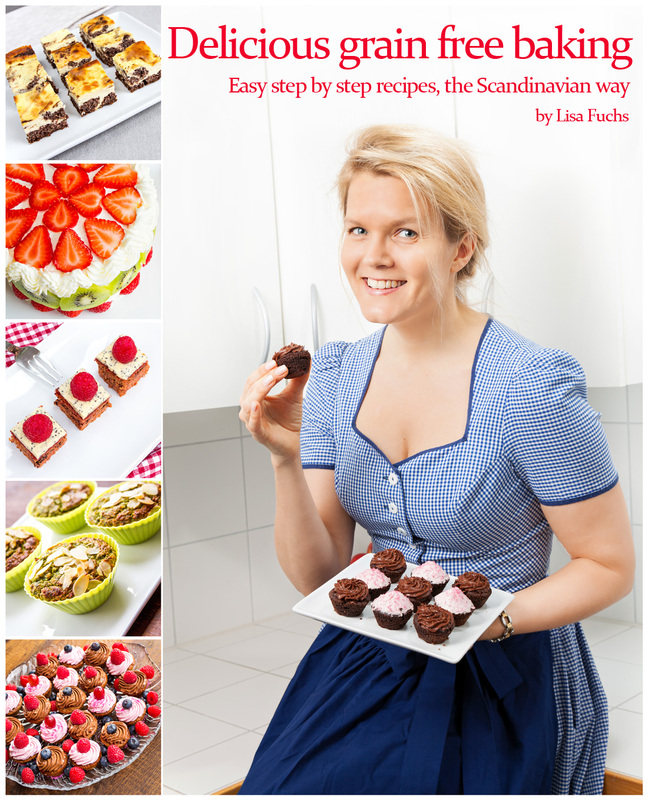 Baking for a bigger group – my tip is still – make mini muffins or mini cupcakes! Some people (and for sure kids!) often like to just have a small treat and leave it at that. Pictured is a normal sized one hewever – since I made them as a dessert for just the four of us this time. and 1 tbsp of vinegar. This will react with the baking powder and help your muffin rise. I used a dark balsamico, but use what you have. 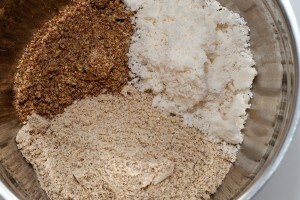 In a smaller bowl mix the dry ingredients. and I know it sounds weird but add ¼ teaspoon of salt. Trust me on this – it brings out the chocolate flavor. That’s it for the dry stuff. 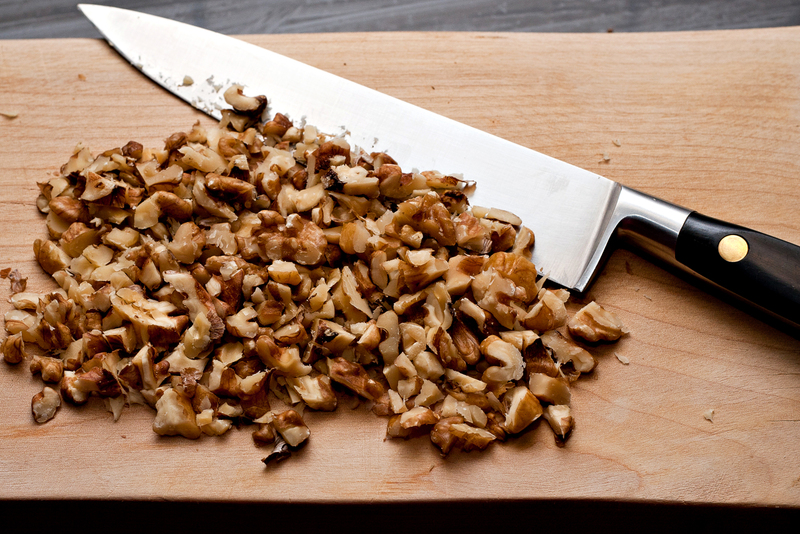 Now, melt something like 3 tbsp’s of butter (or ghee, or use a nut oil) and let cool a bit. 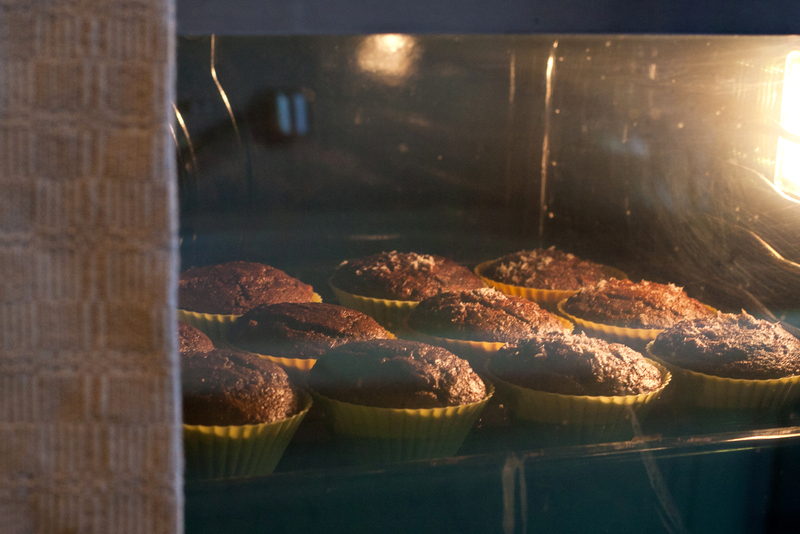 I know that is hard to measure – but you know, it’s not that important to be exact… Half the time I even forget to put it in at all – find it a day later, still in the microwave… (hmmm…) and the muffins still turns out ok! Instead, now add dry ingredients (and nuts) to the egg-banana mix and keep whisking. Lastly add the melted butter, and stir. 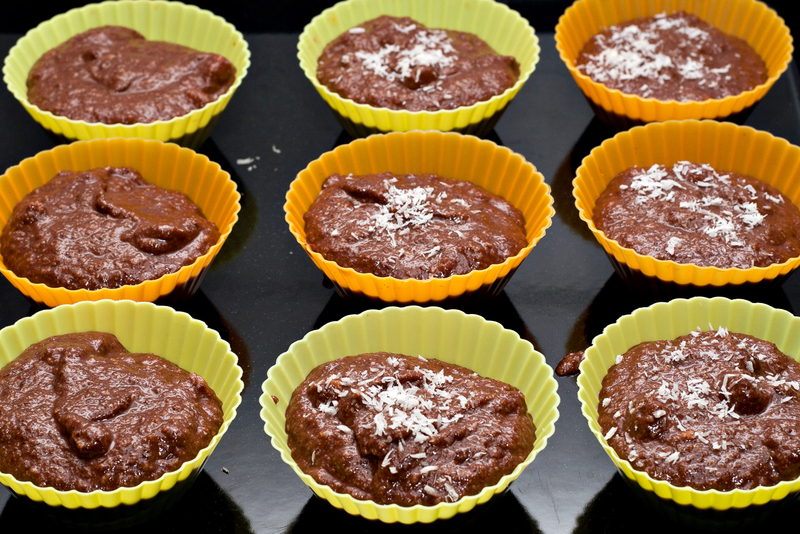 Place muffin forms on a baking tray and fill them. I used the normal size forms since I have no intention of treating anyone outside the family today, but you know – minis will last longer in a crowd…. If you have not planned to turn the muffins into cupcakes – you could top them off with some shredded coconut or sliced almond just to make them look nice on their own – I did that to the right ones in the picture. Off into the oven – bake in the middle part – minis for about 18 minutes, and normal sized ones for about 22-23 minutes. When done – let cool under a tea towel. Meanwhile – I’ll let you in on the secret to making the easiest and loveliest chocolate cupcake topping…. Melt 100 g dark chocolate. I used 85% (that means, really dark – if you want a “milder” taste, go with 70% or even lower). 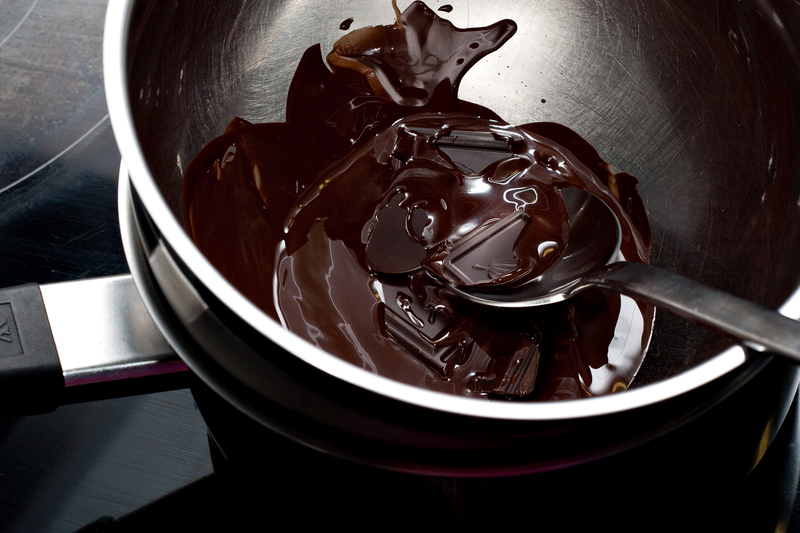 Break the chocolate into pieces and put in a bowl in a pot of hot (but not boiling) water. Once melted – take the bowl out of the pot and stir in 200 ml (0.8 cup) of full fat natural yoghurt. Stir until nice creamy and even. 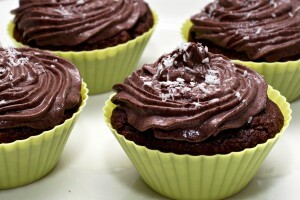 With a spoon, place the chocolate yoghurt mix in an icing bag / pastry bag (or use a freezer bag and cut of one corner). Work in a spiral slowly, from out to in, to decorate the muffin. Focus – you can do this! Then let it snow – just a few flakes of shredded coconut on the top. Perfect! Keep in the fridge until eaten. If you are making mini cupcakes – you might want to double the amounts of the topping (chocolate and yoghurt) to make enough for the whole batch. 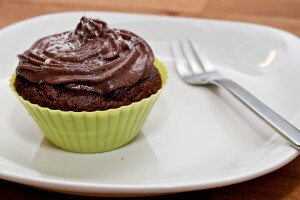 There tends to be a higher “topping-to-muffin-ratio” when they are smaller….